They say that the first time it’s a fluke, second time it’s a coincidence, but the third time, it’s a tradition. Or at least, just as much can be said about the Roccasecca Project during Candlemas. 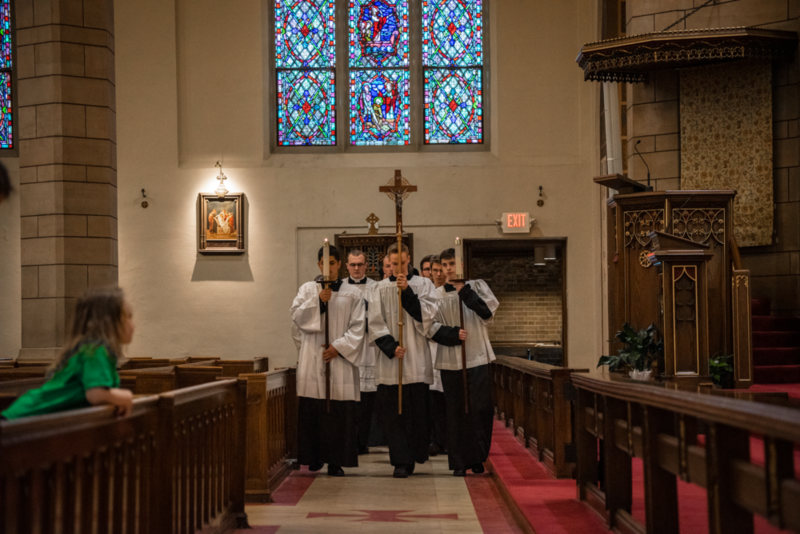 By now a budding tradition within the St. Thomas Catholic alumni, the Church of St. Mark hosted for the third consecutive year a Tridentine mass and seasonally appropriate lecture. 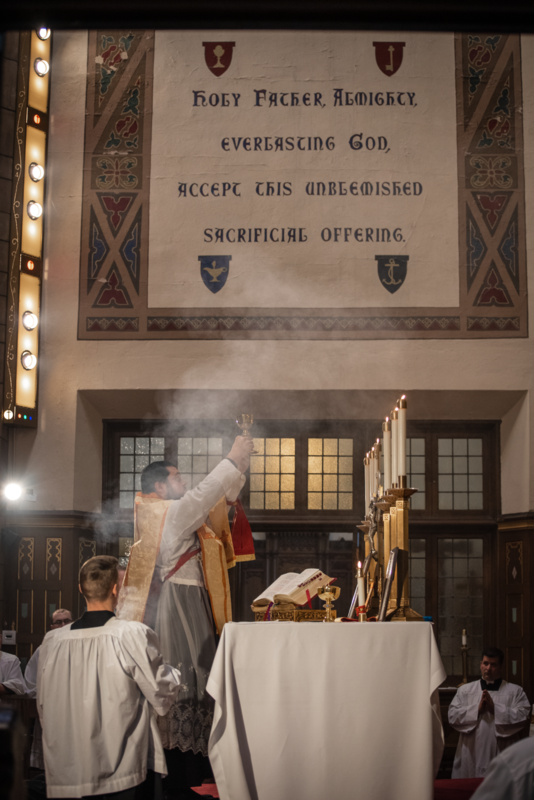 This year, Roccasecca had the distinction of hosting Dr. David Deavel, who premiered his piece on the mystery of Candlemas that was later featured in the Catholic World Report. As a Chestertonian, Dr. Deavel looked at the issue from the perspective of the “Jolly Journalist” – of the Feast of the Presentation as the fruition of the Nativity, which is itself the fulfillment of the promise God made to all men. This promise was to illuminate what was best in man, and what was best in man is revealed in flesh at the incarnation. But as Chesterton, and subsequently Dr. Deavel noted, such a revelation can only be qualified by faith. This was not some addition of an alien quality wholly unknown to man – something he must “evolve” into. Nor is it the actualization of some deeply-possessed potential common to all. Grace is more than just self-improvement on the one hand, or evolution on the other. Rather, it is the illumination through grace of the truth one always knew. The shepherds keeping watch over their flocks, the magi attuned to the movement of the celestial world, and those like Simeon and Anna, who kept constant vigil at the Temple, were merely brought into the fullness of a life they were already living. One as living witnesses to the light of God. Even the demonic presences in the world react the same way. Whether it be King Herod or the devils themselves, the revelation of Christ stirred something of a deeply-held dread they heretofore could only imagine to be real. Grace to them is their natural antithesis, and they recoil from it with the same instinct as those which drive those more properly disposed to be drawn to it. Gnosticism this is not. Therapeutic self improvement this is not. It is instead the action of grace upon the soul, which the soul is free to accept or reject of its own free will. And of its own free will the soul can chose to either attempt to conceal or reveal the light that God sends upon the world. St. Paul was clear about his need to receive the transforming power flowing from Christ’s death and resurrection. Where do we look to find not only virtue embodied but also the efficacy by which we ourselves may become virtuous? 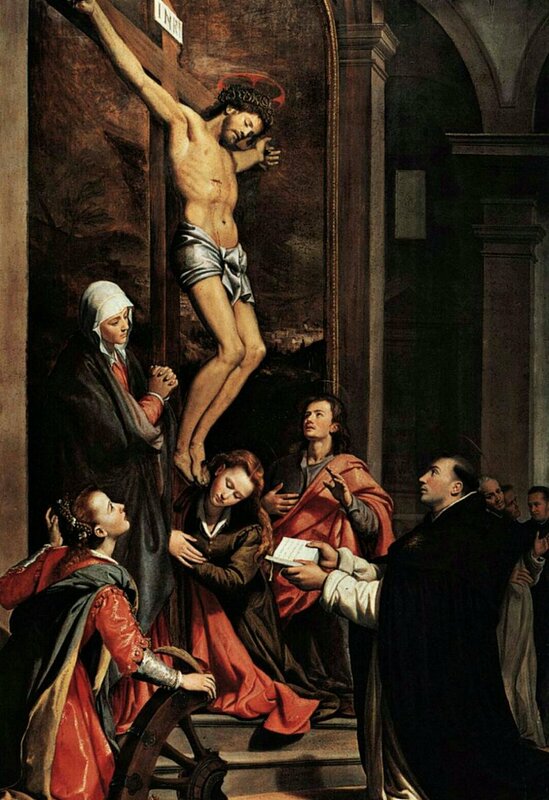 Our patron St. Thomas Aquinas directs our attention to the Cross of Christ as the exemplification of every virtue. In the below text taken from the Office of Readings for his January 28th feast, we are invited to ponder Christ on the Cross as the example of the virtuous life which is open to us by grace. Let us go there with him, and the Saints of every age, who have taken their place beneath that wellspring of virtue. May the waiting and watching of these holiest days draw us to aspire after growth in every virtue. Let us seek His example, we who have so much need of encouragement of the possibility of our ever-fuller transformation in Christ. Lent is undoubtedly a season for growth in holiness, but so too are the fifty days of Easter celebration. From all of us at the Roccasecca Project, we wish you a graced celebration of Christ’s Resurrection and look forward to being together in the radiance of the Easter Season for our next gathering on Sunday, April 15th. It will be a leisurely afternoon of faith, inspiration and friendship in Christ, entitled “A Church that Moves the World”. Special guests include friends from Italy: Fr. Cassian Folsom, O.S.B., founder of the Benedictine Monastery of Norcia, Marco Sermarini, founder of the Tipi Loschi and Scuola Chesterton of San Benedetto del Tronto and president of the Italian Chesterton Society. Additionally, Dr. Michael Naughton, Director of the Center for Catholic Studies and Dr. Catherine Deavel, professor of Philosophy at the University of St. Thomas will round out the lineup of speakers. The topics of reflection will center on the discovery of the Communion of Saints and friendship as essential to the Church’s mission and the task of renewing and rebuilding Catholic culture. A special feature, along with refreshments and Italian appetizers, will be a tasting of Birra Nursia: a beer brewed by the Monks of Norcia. 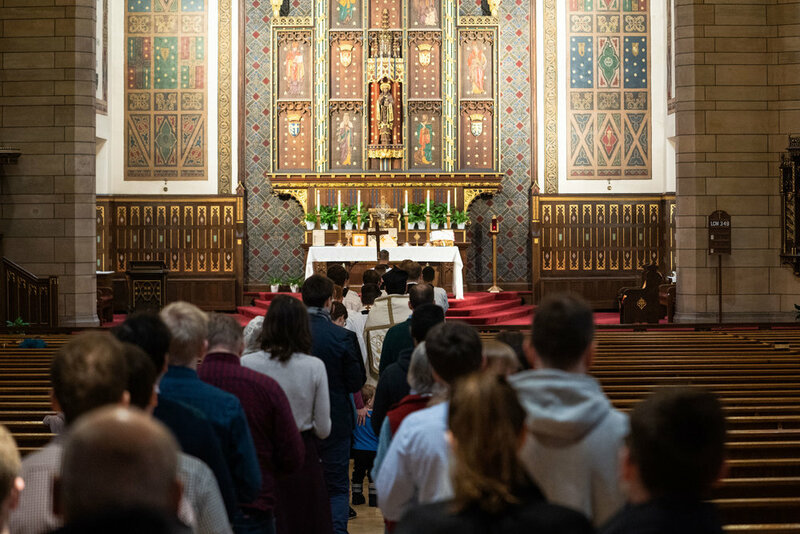 The afternoon will conclude with Sung Vespers and Benedictine and a chance to remain for confession and Holy Mass. What a way to spend a Sunday afternoon! For more information on this upcoming event that will be hosted at Holy Cross Catholic Church in Northeast Minneapolis click here. 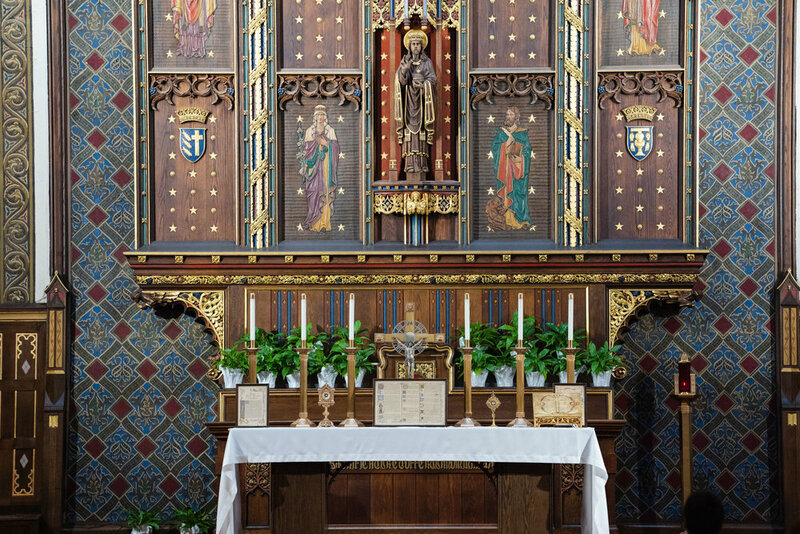 You can visit the Holy Cross parish website. Why did the Son of God have to suffer for us? There was a great need, and it can be considered in a twofold way: in the first place, as a remedy for sin, and secondly, as an example of how to act. It is a remedy, for, in the face of all the evils which we incur on account of our sins, we have found relief through the passion of Christ. Yet, it is no less an example, for the passion of Christ completely suffices to fashion our lives. Whoever wishes to live perfectly should do nothing but disdain what Christ disdained on the cross and desire what he desired, for the cross exemplifies every virtue. If you seek the example of love: "Greater love than this no man has, than to lay down his life for his friends." Such a man was Christ on the cross. And if he gave his life for us, then it should not be difficult to bear whatever hardships arise for his sake. If you seek patience, you will find no better example than the cross. Great patience occurs in two ways: either when one patiently suffers much, or when one suffers things which one is able to avoid and yet does not avoid. Christ endured much on the cross, and did so patiently, because when he suffered he did not threaten; he was led like a sheep to the slaughter and he did not open his mouth. Therefore Christ’s patience on the cross was great. In patience let us run for the prize set before us, looking upon Jesus, the author and perfecter of our faith who, for the joy set before him, bore his cross and despised the shame. If you seek an example of humility, look upon the crucified one, for God wished to be judged by Pontius Pilate and to die. If you seek an example of obedience, follow him who became obedient to the Father even unto death. For just as by the disobedience of one man, namely, Adam, many were made sinners, so by the obedience of one man, many were made righteous. If you seek an example of despising earthly things, follow him who is the King of kings and the Lord of lords, in whom are hidden all the treasures of wisdom and knowledge. Upon the cross he was stripped, mocked, spat upon, struck, crowned with thorns, and given only vinegar and gall to drink. Do not be attached, therefore, to clothing and riches, because "they divided my garments among themselves." Nor to honours, for he experienced harsh words and scourgings. Nor to greatness of rank, for "weaving a crown of thorns they placed it on my head." Nor to anything delightful, for "in my thirst they gave me vinegar to drink." The Roccasecca Project is a cultural apostolate under the patronage of the Angelic Doctor, made up of alumni of the University of St. Thomas in St. Paul, Minnesota. We remain engaged in the life and future of our Alma Mater by fostering friendship and collaboration among alumni and students. Grateful for what we have received during our time as students, we resolve to build upon it and create opportunities for further intellectual and spiritual formation.